The adopted criteria provide vertical clearance values for the various highway functional classifications (Table 19). These criteria are set to provide at least a 1-foot differential between the maximum legal vehicle height and the roadway, with additional allowances for future resurfacing. These clearances apply to the entire roadway width (traveled way and shoulders). A formal design exception is required whenever these criteria are not met for the applicable functional classification. The specific standards for vertical clearance adopted for the Interstate System maintain its integrity for national defense purposes. On Interstates, the clear height of structures shall not be less than 16 feet (4.9 meters) over the entire roadway width, including the useable width of shoulder. In urban areas, the 16-foot (4.9-meter) clearance shall apply to at least a single routing. On other urban Interstate routes, the clear height shall not be less than 14 feet (4.3 meters). A design exception is required if this standard is not met. Exceptions on the Interstate must also be coordinated with the Military Surface Deployment and Distribution Command Transportation Engineering Agency of the Department of Defense. *17 feet (5.1 meters) for sign trusses and pedestrian overpasses. The adverse effects of structures with insufficient vertical clearance are obvious (see FIGURE 24). Impacts to low bridges create risk for the driver of the vehicle, others on both roadways, and in extreme situations can result in closure of the bridge for lengthy periods and necessitating costly repairs. 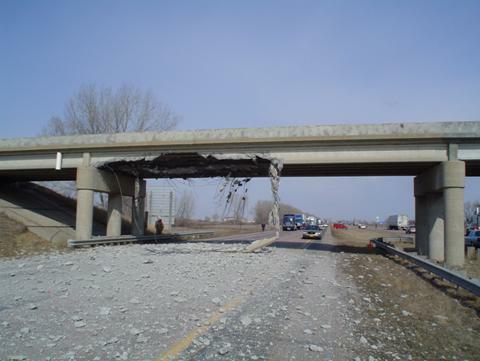 Interstate closure after an impact with a bridge. Figure 24 is a photo showing damage caused to the underside of an interstate bridge as a result of being struck by a vehicle that was too tall to pass underneath. Pieces of concrete are scattered over the roadway, completely closing that direction of the interstate. Table 20 summarizes the potential adverse impacts to safety and operations of a design exception for vertical clearance. Freeway: high-speed, multi-lane divided highway with interchange access only (rural or urban). Expressway: high-speed, multi-lane divided arterial with interchange and at-grade access (rural or urban). Rural 2-Lane: high-speed, undivided rural highway (arterial, collector, or local). Urban Arterial: urban arterials with speeds 45 mi/h (70 km/h) or less. A Policy on Design Standards Interstate System, AASHTO, 2005. Federal Aid Policy Guide, FHWA, 2005. A Policy on Geometric Design of Highways and Streets, AASHTO, 2004. Guidelines for Geometric Design of Very Low-Volume Local Roads (ADT ≤ 400), AASHTO, 2001.